Phlebectomy is a simple procedure to physically remove a dilated or varicose vein from the body. This is usually reserved for a small problematic vein. The varicose vein is first outlined with a marker. The skin is then cleansed to prevent infection. Using sterile technique, the skin is numbed using local anesthetic. Small incisions are made along the course of the varicose vein. 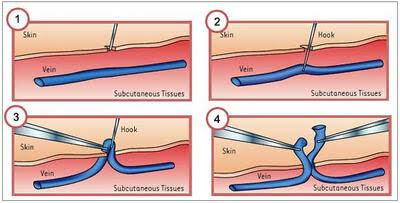 Using these incisions, small tools are used to identify the underlying diseased vein and remove it in sections. Once the vein has been removed, the incision is bandaged. Depending on the type and number of incisions needed to remove the problematic vein, patients may be asked to follow up for suture removal or site check. In addition to removing the problematic vein, it is important to address any major veins that demonstrate reflux or insufficiency to minimize the possibility of recurrent varicose veins.